Nationally acclaimed wildlife artist Nancy Glazier knew early in life she would become an artist. Born in Salt Lake City, Utah and essentially self taught, her childhood artistic efforts were praised by both parents and by the age of eighteen, she had left home, tutored art and supported herself selling her works. Some thirty years later, Nancy continues on an endless quest, searching for beauty deep within the painted surface, bringing life and spirit into the dimensional aspect of her paintings. Today, Nancy is best known for her magnificent paintings of North American wildlife in their natural habitat, portrayed amid majestic backdrops. With every brush stroke she communicates a deep commitment to the preservation of wildlife and the environment. The year 2000, however, has brought about a new dimension to her work. Nancy explains, "In the spring of 2000, a season of new beginnings, an inner door flew open, and my first "left hand" wildlife paintings emerged." Although not ambidextrous, Nancy's new "left-handed" paintings combine her years of training with accessing her mind through new channels. These new works ensue on canvas a contemporary and fluid feel, each brush stroke expressing an intense vibrant beauty and inner energy. And as Nancy explores this new realm of design she reminds us that new beginnings allow us "to sing and to fly and to feel the wind through our fingertips"…but only if we dare to explore the possibilities of change." 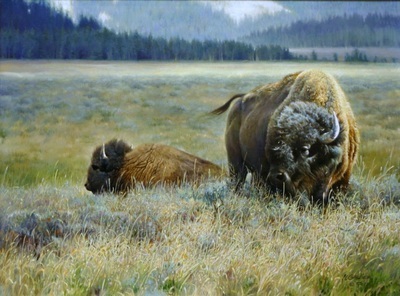 Nancy was named Wildlife Artist of the Year in 1992 and has since won many awards and accolades. Her paintings are held in many private and corporate collections around the world including the Hiram Blauvelt Art Museum, and she has exhibited with The Leigh Yawkey Woodson Museum of Art and the Pacific Rim Wildlife Art Show. Two of her magnificent original oils hang in the LDS Museum of Church History and Art in Salt Lake City, Utah.